We’ve been on the search for this sandwich for a few years. Yes, years. One of my husband’s favorite delis closed a few years ago and along with it left his absolute favorite porchetta sandwich. Now, don’t get me wrong there have been others, but they are all runner-ups to the sandwich we think of fondly and crave regularly. Quite frankly, we thought the next time we’d find a porchetta sandwich worth telling everyone about would be when pigs fly. Well, pigs are flying because last week we found a replacement for the long lost Porchetta, and we found it during our first visit to Porky’s in downtown Shelton. Porky’s Housemade Porchetta is made of a slow cooked porchetta (Italian pork roast), which is seasoned with garlic, salt, pepper, and fennel. 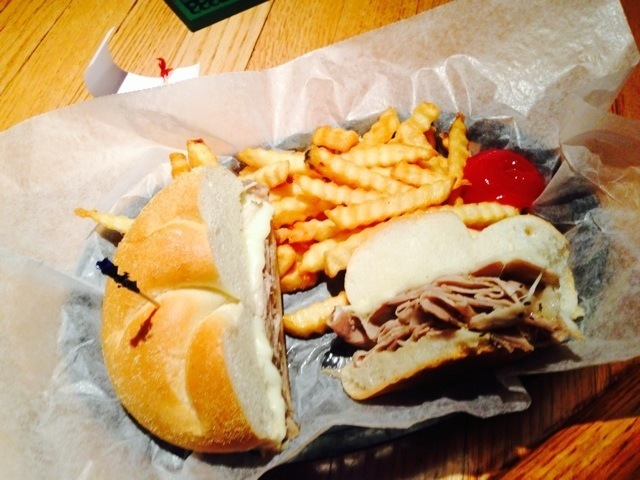 The porchetta is sliced thin like deli meat, piled on a hard roll, and topped with hot peppers and mozzarella cheese and served with a side of fries and a pickle. 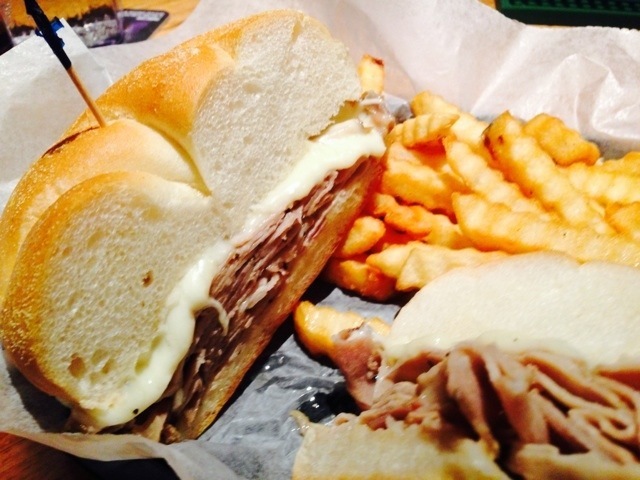 The sandwich pictured above is without hot peppers. I must add how pleased we were with the fries. Crinkle cut fries are often soggy, but at Porky’s they are the exact opposite. Cooked until they reach a crispy texture and golden brown color, the fries are only slightly greasy as you’d expect when eating fries. The staff at Porky’s is extremely friendly and will help you if you can’t decide what to order. They also proudly share how everything is Housemade from the porchetta to the meatballs to the pizza sauce. See! Like I said, flying pigs. Don’t forget to buy a tshirt when you visit! 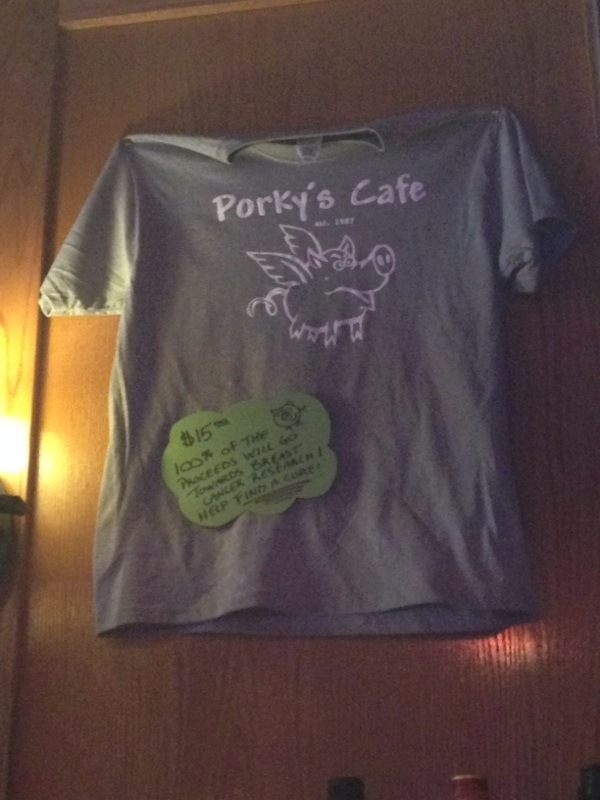 100% of Porky’s Cafe tshirts are donated to breast cancer research – stop by and buy a shirt! Porky’s does offer take-out orders.